If you get boredwith plain and boring subtitles, you can create a new one with the sharp, size, color and other parameters you like by using the group of Text Effects. 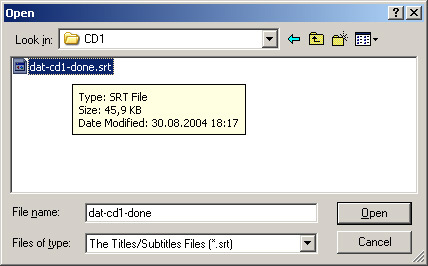 If a DVD and video file you play have the subtitle file, simply adjust it with these Text Effects. In the Effect list pane go to Video group > Text group > Subtitle effect. Double click on Subtitle effect. When this effect gets added to Effects to apply list, right mouse click on it and in the context menu choose Properties, Subtitle Settings dialog box will come up. To indicate the path to the subtitles you can either type it down in Subtitle File field, or click on Open button and choose the proper file there. · Click on Parameters button and Font dialog box will appear, where you can change some subtitle settings. Let’s study them one by one. (1) Name combo box provides you with the most popular kinds of types for your subtitles. (3) Size combo box is designed to select the size of your future subtitles. (4) Color button allows you to select the color of the subtitles. If you want your adjustments to take place, click OK button on Subtitle Effect settings dialog box, if you do not want it – click Cancel. In the Effect list pane go to Video group > Text group > 3D Subtitle Editor. 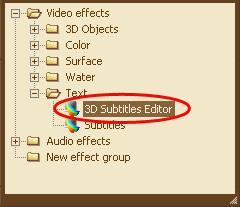 Double click on 3D Subtitle Editor. When this effect gets added to Effects to apply list, right mouse click on it and in the context menu choose Properties, 3D Subtitle Editor Settings dialog box will come up. 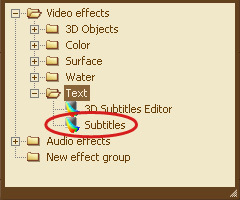 If the opened video or DVD file has its own subtitles you can indicate the path to it by clicking Open button (1) on 3d Subtitle Editor Dialog box. If you do, Open dialog box will appear. Note: You can only open (*.srt) or other supported subtitle file here.